On the 20th anniversary of the IRA ceasefire, it’s interesting to wonder if the current British and Irish governments could have delivered an end to the Troubles if they’d been in power in 1994? On the basis of their stewardship of this calmer phase of history, it is argued that the answer has to be a resounding no. Under the Cameron and Kenny era of Anglo-Irish relations, they have built on the work of their predecessors to draw London and Dublin closer. But Belfast has arguably been sidelined. 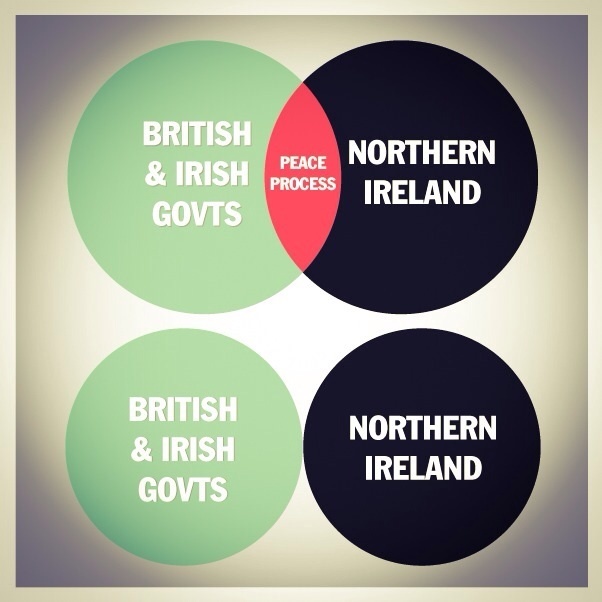 The British and Irish governments have allowed the peace process to fall into a holding pattern, like a plane circling an airport but never coming in to land. And as the Northern Ireland Assembly prepares to begin a new session, politics here is still going round in circles. Stormont is currently gripped by the dispute over welfare reform that divides the DUP and Sinn Féin. The nature of the welfare stand-off – with the DUP ready to implement cuts and Sinn Féin refusing to do so despite the threat of Westminster fines – adds a fiscal veneer to political divisions here. But the split at Stormont runs much deeper than economic philosophy. It is political, cultural, constitutional and doctrinal. :: The DUP must decide if it will deliver on the deal to pass the symbolic role of Assembly Speaker to Sinn Féin. And the wider speculation over Peter Robinson’s future as DUP leader also persists. :: This autumn will see the Assembly standards committee receive a report into the scandal that engulfed Peter Robinson’s wife Iris. A separate report by the committee monitoring DUP Housing Minister Nelson McCausland is also to be raised at Stormont. :: The October Monitoring round, which will see a further reshuffling of Stormont’s strained budget, will again heighten tensions over the Assembly’s finances. Virtually every Stormont department faces some form of cash crisis. :: Sinn Féin shows no sign of compromising on its opposition to welfare cuts, and may actually step-up its anti-austerity message on both sides of the border. :: The DUP and Sinn Féin face tensions over implementing strategies on tackling sectarianism, on supporting the gay community and ethnic minorities, and on tackling poverty. :: Outside the Assembly, fresh tensions and violence have opened up between loyalist paramilitary factions. :: Scotland’s referendum on independence will decide the future of the UK, but even a vote to save the Union will deliver further devolution for Scotland and raise major issues for Stormont. :: Summer tensions over loyal order parades continue to linger, while a parliamentary committee’s review of the On The Runs issue is also ongoing. :: And hanging over all of this is the preoccupation of the political parties with the looming general election, and possibly even an early Assembly election. Key figures reflecting this week on the historic emergence of the peace process have recalled that the prime objective of creating the power-sharing Assembly was to provide a platform for this society to consolidate peace and work towards reconciliation. Good governance would be a bonus. That’s why sources from the US in particular are trying to remind Stormont of the importance of the stalled talks on parades, flags and dealing with the legacy of the Troubles. They say that Stormont is not delivering on the prime objective of reconciliation. But Stormont was never supposed to do it alone. The British and Irish governments are also culpable. The Good Friday agreement that emerged after the ceasefires of 1994 incorporated three strands of relationships: the Belfast parties, but also London and Dublin. Twenty years later, the Cameron and Kenny governments are instead standing back, and claiming that controversies are to be solved by the Belfast parties alone. If such thinking had prevailed in the 1990s, would we have seen the ceasefires and the Good Friday Agreement?